The latest data is showing an alarming productivity decline in the euro-zone. 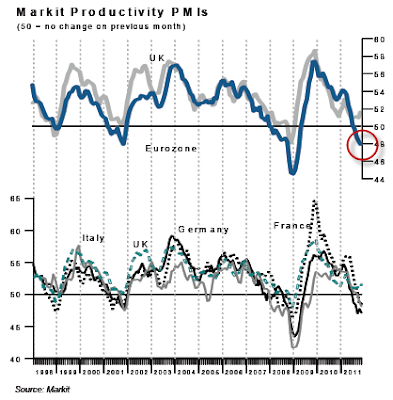 The Markit PMI productivity index declined at a pace not seen in 32 months. This is caused by a rapid drop in output with a workforce whose numbers have not been adjusted to the decline. Diminished output per employee brought down productivity. The biggest drop actually came from Germany, likely driven by declines in orders from spooked euro-zone clients. Sadly this may translate into an increasingly higher unemployment in the euro-zone, which already stands at 10.3% (Spain at 22.8%).